Chop and Serve Folding Cutting Board Just $4.99! Down From $29! Ships FREE! You are here: Home / Great Deals / Chop and Serve Folding Cutting Board Just $4.99! Down From $29! Ships FREE! 13 Deals has this Chop and Serve Folding Cutting Board on sale for $4.99 (Reg. $29)! The Chop and Serve is the easiest way to slice and dice your ingredients and deliver them to the pot or skillet when cooking! 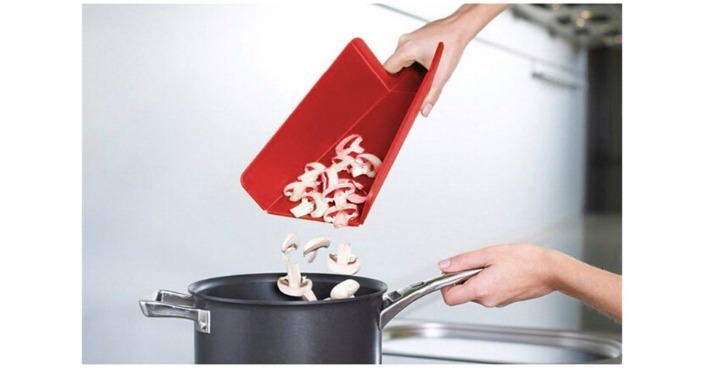 This ingenious design allows you to cut food on a knife friendly surface and then neatly direct it into the cooking vessel with the fold up sides. The Chop and Serve is 100% food safe polypropylene and will not warp, chip or splinter and cleans up easy in the dishwasher. Measures 8 x 15 inches.